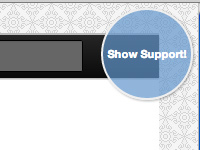 Show Support Ribbon displays a customizable “show support” ribbon, banner, or badge on your site. Show support for your favorite cause, event, charity, political event, or anything else that’s awesome. 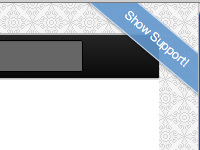 Show Support Ribbon includes four built-in ribbon styles and makes it easy to customize with your own CSS. Keep in mind these styles are just to get you started with your own custom support ribbon. Check out this screenshot to see some of the other CSS recipes included with the plugin. 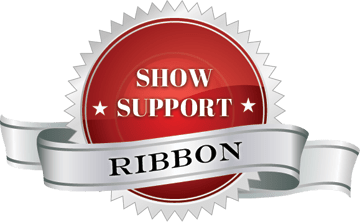 Show Support Ribbon is made to be customized, so cut loose and have some fun. 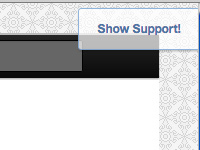 Visit the “Show Support Ribbon” options page, choose your settings, save changes, done. Thx. for a great plugin! Apparently it doesn’t work properly as a “ribbon” in IE8. It does not display as a 45 degree banner but instead still horizontally. Any fix possible in the future? Thanks for the feedback. 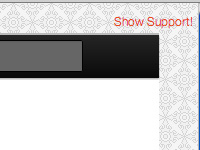 No plans for IE8 support, but you should be able to style your own using the custom-CSS option in the plugin settings. For example, you could display an image that is rotated, which would eliminate the need for the CSS rotation styles (which is what isn’t working in IE8). Wow! Well done. Nearly perfect right out of the box. Tweaked the background color a bit to match my theme and moved on. It’s so refreshing to implement a plugin and have it just work. In the plugin settings, choose the “Custom” option for styles. Then you can either add CSS thru the form, or leave it blank and use an external stylesheet.